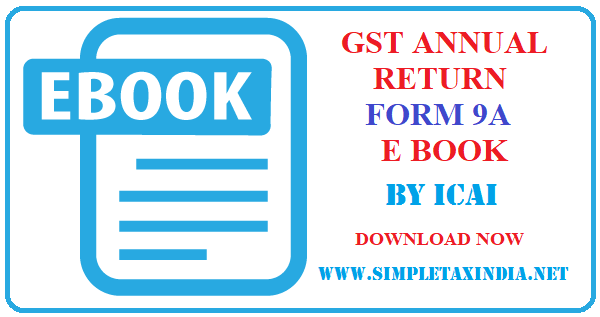 In order to understand the gamut of the GST Annual returns and its requirement, it would be relevant for us to understand the legal provisions relevant for GST Annual Returns. Two important provisions which are relevant and important in this context are Section 35(5) and Section 44(1) of CGST Act, 2017. In terms of section 35(5) “every registered person whose turnover during a financial year exceeds the prescribed limit shall get his accounts audited by a chartered accountant or a cost accountant and shall submit a copy of the audited annual accounts, the reconciliation statement under subsection (2) of section 44 and such other documents in such form and manner as may be prescribed”. Section 44(1) requires that every registered person, other than an Input Service Distributor, a person paying tax under section 51 or section 52, a casual taxable person and a non-resident taxable person, shall furnish an annual return for every financial year electronically in such form and manner as may be prescribed on or before the thirty-first day of December following the end of such financial year. This form is notified by the government vide Notification 39/2018 on 4th September 2018. Further, Section 44(2) mandates every registered person who is required to get his accounts audited in accordance with Section 35(5) to furnish the copy of audited annual accounts and a reconciliation statement reconciling the value of supplies declared in the annual return with such audited annual financial statements. 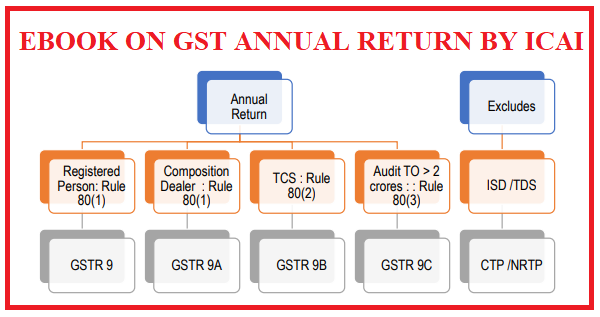 In terms of Section 44(2), Rule 80(3) requires every registered person whose aggregate turnover during a financial year exceeds two crore rupees shall get his accounts audited as specified under sub-section (5) of section 35 and he shall furnish a copy of audited annual accounts and a reconciliation statement, duly certified, in FORM GSTR-9C, electronically through the common portal either directly or through a Facilitation Centre notified by the Commissioner. 2. Person paying tax under composition scheme is required to file annual return in form GSTR9A – Proviso to Sub Rule (1) of Rule 80. 3. Every electronic commerce operator who is required to collect tax at source under section 52 shall furnish annual statement in form GSTR - 9B – Sub Rule 2 of Rule 80. 4. Nil Annual Return- A person registered under GST but having no transactions during the year is still required to file a Nil Annual Return. A person who has got his registration cancelled during the year is also required to file the respective Annual returns. 5. A Registered person who has opted in or opted out of composition is required to file both GSTR 9 & GSTR 9A for the relevant periods.